Consider an empty bottle or can, one of the hundreds of billions of beverage containers that are discarded worldwide every year. Empty containers have been at the center of intense political controversies, technological innovation processes, and the modern environmental movement. Making a Green Machine examines the development of the Scandinavian beverage container deposit-refund system, which has the highest return rates in the world, from 1970 to present. Finn Arne Jorgensen investigates the challenges the system faced when exported internationally and explores the critical role of technological infrastructures and consumer convenience in modern recycling. 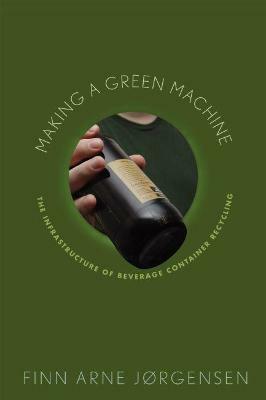 His comparative framework charts the complex network of business and political actors involved in the development of the reverse vending machine (RVM) and bottle deposit legislation to better understand the different historical trajectories empty beverage containers have taken across markets, including the U.S. The RVM has served as more than a hole in the wall--it began simply as a tool for grocers who had to handle empty refillable glass bottles, but has become a green machine to redeem the empty beverage container, helping both business and consumers participate in environmental actions. "Finn Arne J rgensen has produced an absorbing and entertaining study of one specific aspect of re-use and recycling in his exploration of what factors influence the fates of empty bottles and cans. It delivers insight into the complex relationships between the evolution of national environmental policies and the nexus of business interests, technological development, and everyday environmentalism. Making a Green Machine is a welcome and useful addition to the growing literature on how societies conceptualize and manage consumer wastes." ..".a strong work that should serve as a resource for advocates, planners and policymakers, as well as an illustration of the strengths of an historical approach to science and technology studies."